The Reno High Junior Varsity continued their success this season by winning the Reed Easter Tournament. Reno High defeated the Galena Grizzlies JV team in the championship game. Drew Simpson was named the Most Valuable Player of the tournament. Notes: The Reno Knights A schedule has been updated. The last time Marc Kaiser and James Holcomb played together was the state championship game in 1999. Both pitched for the Huskies, and when they were not on the mound, Holcomb played third base and Kaiser played mainly right field. Seven years later both have pushed themselves to compete in the minor leagues. They both faced one another for the first time at the professional level this past Wednesday, April 19. Kaiser earned the win giving up three earned runs in six innings of work. Holcomb gave up one earned run over 3.1 innings pitched. This was Kaiser’s first Double-A win. Notes: Jimmy Wallace, another member of the 1999 team, will also be playing for the Chico Outlaws of the Golden Baseball League this year. The Reno High Junior Varsity team is off to a great start to the 2006 season. Head Coach Scott Sass has prepared the team, focusing on the fundamentals of the game. The team has responded well, and the future looks bright for this outstanding group of Reno High baseball players. Posted: 4/7/2006Alex Gardner remembers his first day of practice as a Reno Huskies baseball player. Reno Huskies baseball is not for the timid, weak or shy. “The first time you meet Coach (Pete) Savage, it is real intimidating,” senior pitcher Bryan Carano said. If Savage’s detail-oriented, no-nonsense approach isn’t enough to scare a young Husky, there’s always the retired numbers of Reno legends Fred Dallimore, Bud Beasley and Shawn Boskie out on the center-field fence or the baseball-styled signs along the backstop fence commemorating all the state titles and region championships. “It’s totally overwhelming to play here with all of the tradition,” Gardner said. “But that’s what is so cool about it, too. You want to leave your legacy here. It makes you want to come out here and be the best you can be, to make sure that before you leave here, you don’t have any regrets.”This is the 12th season that Savage and his staff have gotten the best out of the Huskies. Reno, 15-2 after defeating Damonte Ranch, 3-0, on Thursday has won nearly 80 percent (336-88 record) of its games, four regional titles (1999, 2000, 2003, 2004) and one state title (2004) under Savage since 1995. The Huskies have clearly become one of the model baseball programs in the state. The Hu skies have failed to qualify for the state tournament just three times under Savage. The 2002-04 Huskies had an unbelievable run of two regional titles, one state championship and 105 victories in 118 games. If there is a baseball academy in Northern Nevada, it’s home is down on Booth Street and Foster Drive in the heart of Reno and it is dressed in Reno Huskies red, white and blue. The Huskies excel on and off the field. This year’s team, Savage says, has a 3.5 grade point average. Savage has created something bigger than any one player or one coach. He’s built a baseball machine that seems to feed off itself and grows stronger with each passing season. Savage points out that the Reno baseball way was in place long before he took over the program in 1995. Want consistency? The Huskies have yet to win fewer than 22 games in a season under Savage, a streak that seems safe this year with 14 victories in their first 16 games. There are currently four former Savage players in professional baseball’s minor leagues (Jeff Schoenbachler, James Holcomb, Jim Wallace, Marc Kaiser) and 16 in college. Sending even one kid to college through baseball is more important to Savage than winning a dozen state titles. Baseball at Reno High is about more than hits, runs and errors. Baseball is definitely not a walk in the park at Reno High. Everyone who wears a Reno uniform, from the assistant coaches to the last kid on the roster who might get five at-bats all season, is subject to the Savage work ethic. Colton cherished his nine years working under Savage and the two still talk almost daily. Polson, even though he coaches a rival team, also talks to Savage on a regular basis. “Pete isn’t afraid to hire assistant coaches who might know more about a certain area of the game than he does,” said Colton, a former Wolf Pack and Kansas City Royals minor league pitcher. “A lot of coaches are afraid of that. They want to run the whole show. Not Pete. “I was in charge of the pitching. Jon Polson was the hitting coach and set the outfield defense. Steve Boucher was the infield coach. Pete was in charge of the personnel, keeping the kids in line, filling out the lineup card and coaching third. 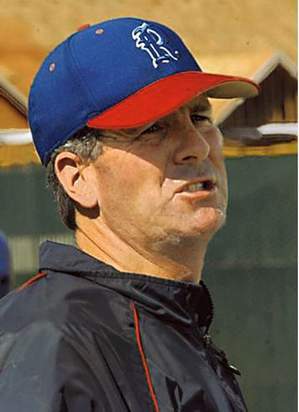 Polson left after the 2003 season to start the Damonte Ranch program. Colton retired from coaching so he could spend more time watching his sons Adam and Ben play college baseball. Savage clearly practices what he preaches. Garrett Luippold struck out a career-high 16 to lead the Reno High baseball team to a 3-0 victory over Damonte Ranch at Reno High on Thursday. Davis Banks provided all the offense Luippold and the Huskies would need, a solo home run in the fourth off tough-luck loser Matt Gardner. Luippold allowed four hits, Gardner six. Banks also had a double, and Reno’s Al Gardner, no relation to Matt Gardner, had an RBI triple in the Huskies’ two-run sixth.